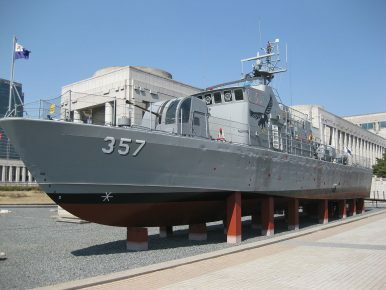 A replica of the battle-damaged South Korean patrol boat following the Second Battle of Yeonpyeong in 2002, on display at the War Memorial of Korea. South Korea will host its first Winter Olympics at the resort town of PyeongChang between February 9 and February 25, 2018. Seoul sees this event as an opportunity to engage with North Korea and to restore stability in the Korean Peninsula. Contrary to this hope, Kim Jong-un’s recklessness and unpredictability could result in provocations before or during the Olympics and a catastrophic path to full blown conflict in the region. North Korea is unlikely to reciprocate South Korea’s friendly gesture for two reasons. First, no North Korean athlete has qualified for the PyeongChang games, offering a legitimate reason for Pyongyang not send any delegation to the South. Second, North Korea has given no indication it is interested in participating or hosting a portion of the Games. Contrary to South Korea’s offer to share the Seoul 1988 Summer Olympics, North Korea has yet to publicly endorse the idea of staging some events or even creating an inter-Korean team. There is no bilateral or International Olympic Committee-mediated discussion underway regarding this possibility. North Korea’s noncommittal response to South Korea leaves open the possibility that Pyongyang will instead provoke Seoul before or during the Olympic Games. Pyongyang views international sporting events as useful venues to undermine Seoul’s status as an advanced, stable country; to demonstrate its own military capability to its population and the international community; and to possibly exploit economic and political concessions from South Korea. There have previously been two major North Korean provocations around the time South Korea hosted international sporting events. In 1987, a North Korean operation sabotaged Korean Air Flight 858 over the Andaman Sea near Myanmar, killing 104 passengers and 11 crew members. This was North Korea’s attempt to disrupt the Seoul 1988 Summer Olympics by fostering an impression that Seoul was unsafe. In 2002, a North Korean patrol boat crossed the Northern Limit Line (NLL) in the Yellow Sea and opened fire on a South Korean patrol boat during the World Cup. The attack killed six and seriously injured nine South Korean sailors, and sank the South Korean vessel. Scenario 1: North Korea conducts a series of missile tests and/or a nuclear test with greater frequency and magnitude to demonstrate its strength to the world. Pyongyang would see these tests as the easiest way to provoke Seoul, as it has been performing them for years. However, these tests may not prove effective in deterring foreigners from participating and visiting the Olympic Games, as they have grown accustomed to such provocations in recent years. Scenario 2: North Korea starts skirmishes near the NLL in the Yellow Sea and/or the demilitarized zone (DMZ). Pyongyang regularly provokes its southern counterpart: exchanging fire, shelling islands, and sinking vessels. The Battles of Yeonpyeong in 1999 and in 2002 are prominent cases. This type of provocation is more likely to cause panic among the public and discourage foreigners from visiting the Peninsula. Scenario 3: North Korea conducts an act of terrorism in South Korea. North Korea can infiltrate special commandos or activate sleeper agents to sabotage transportation hubs, particularly Incheon international airport and high-speed train stations. These locations serve vital function in ferrying athletes and visitors between Seoul and PyeongChang. Though this provocation would be an extremely risky choice for Pyongyang, the country does not shy away from such daring operations to accomplish its objectives, such as the assassination of Kim Jong-nam in Malaysia. Any North Korean provocation before or during the Winter Olympics will be catastrophic. In light of Pyongyang’s missile launches and nuclear test, tension in the Korean Peninsula has already reached an all-time high. Provocation during a high-profile international event is akin to adding gasoline to fire. Such an act will provoke the United States to take a more militaristic posture in the region and cause a strong public backlash at home against Seoul’s effort to engage with North Korea. A high concentration of U.S. strategic assets, lack of dialogue, and public anger can increase the possibility of miscalculating and misunderstanding North Korea’s actions and intentions. As many experts have warned, provocations could lead to war with North Korea – a consequence no wants to experience. All sides should be especially wary in the lead up to PyeongChang 2018. Harry Kim is an MA candidate in Global Policy Studies at the University of Texas at Austin. He is currently a Brumley Next Generation Graduate Fellow in the Robert Strauss Center for International Security and Law’s Understanding China Program. Should North and South Korea Co-Host the 2018 Winter Olympics? What to make of South Korea's idea to shift some Olympic events to North Korea's Masikryong ski resort?